Home » Greenroom » Facial Tissue vs Handkerchief: Which Is More Hygienic? Completely avoiding germs can be quite a challenge especially in the workplace where there are lots of people coming in and out of the office. This is why it’s important to keep the office clean and germ-free at all times. In colder weather, however, it’s going to be a lot harder to save everyone at work from catching a cold! Why is the cold weather to blame? It keeps us all indoors, in a confined area where these flu causing viruses can easily be transmitted by cross contamination, infecting many. There are many cures and ways to deal with the flu and cold, but they are not the topic here. Let’s talk about what to do until those cures start to work! You still need to deal with the runny nose and the mess you cause every time you sneeze. Surely, you use a tissue or a handkerchief of some sort, but what sort? It might seem like facial tissues provide a good solution as they can be safely used and discarded when done, but using a handkerchief can also be effective in protecting the people working in an enclosed area from getting infected. So the big question is, which is healthier and more hygienic to use? Facial tissues or handkerchiefs? Does the use of these items have a significant impact on the environment? Why are your nasal secretions a problem? Nasal secretion is basically the matter that gets ejected into the handkerchief or tissue when you blow your nose. It contains the highest amounts of the flu and cold causing viruses and they can spread through contact. Blowing your nose continuously means a lot of bacteria and viruses from the nasal secretions will end up in your handkerchief or tissue. Keep in mind – there is about 200 known viruses that cause colds and flu. The scientific studies have shown that the rhinovirus classification of viruses is the most common. They are highly resilient viruses that can survive outside the human body for a long period of time. This means the secretions on your handkerchief or tissue will remain potent for as long as three days. If anyone comes in contact with this material within this period, they might become affected and will definitely contribute to the spread of this virus in the workplace. There is a long list of items and situations which can be involved in this quick cross contamination process. They include door knobs, toys, a handshake, mobile phones, water bottles, cutlery, the water dispenser, the computer keyboard, coffee mugs, money and many more. 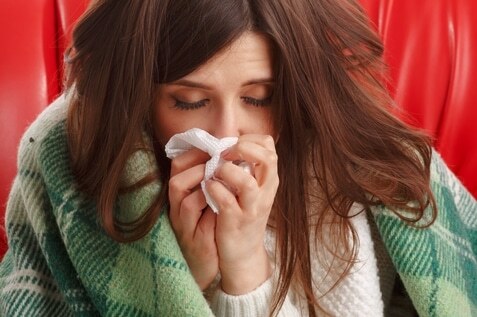 It is very easy for this virus to get into the nasal tracts to cause a cold. A simple touch of a contaminated hand on the nose or eyes can cause an infection. A facial tissue or a handkerchief? The facial tissue is a common item found in our bags and pockets. It is very handy when you need to quickly mop up that sweat off your eyebrows. 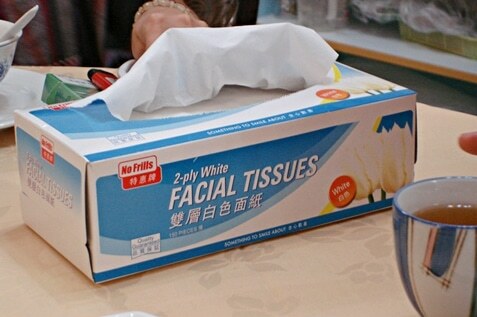 The facial tissue has a high absorbency to quickly dry your face or hands. Other variants of the facial tissues have been made with little amounts of moisturisers to give you a refreshing feeling after use without necessarily having to use soap and water to carry out the conventional face or hand washing. Many people prefer using facial tissues because they are easy to dispose of after use. This way, you blow out the nasal secretions and get rid of the used tissues either by depositing it into a waste bin or composting it. Washing and drying your hands afterwards will protect your family and friends from being infected with any residual virus. Many people find it quite disgusting having to carry an already used handkerchief around with them when they have a cold because they know there will be more sneezing until the cold wears out. This practice also promotes the spread of the virus because the repeated contact with the handkerchief will increase the volume of virus that gets on the hands which is then passed on to other objects that the person touches. Another downside to using handkerchiefs is that a majority of the materials are made from environmentally unfriendly compounds that contribute to the pollution by releasing chlorine or mercury. They might also be non-biodegradable. The best alternative for this is the use of handkerchiefs made from organic resources. They are not as harmful for the environment and they are just as useful as the ‘regular’ ones. The big question here is, should we stick to using a whole lot of tissues every time we suffer from a cold or just use a single handkerchief that can be used many times? You have to admit that a lot of tissues are used every time you suffer from a cold. So what can be a good solution to avert or manage this “waste of tissues” at the expense of our forests and green resources? When it comes to hygiene, the use of tissues remains the best choice. As for the green issues, what should be done is the provision of recyclable tissues. 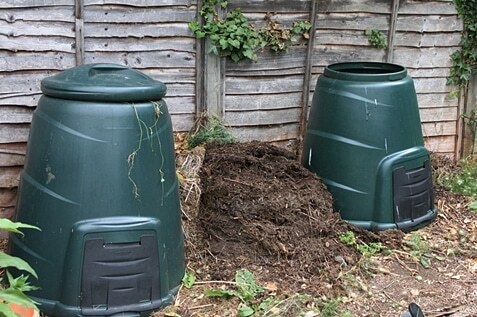 The used tissue paper can be disposed of by throwing them into a compost bin rather than the regular trash can. Your choice of recyclable tissue should be a brand made from post-consumer recycled paper. These products will be free from any trace of chlorine, safe to use, and won’t harm the environment. Health analysts have suggested that the use of tissue paper during colds is more hygienic and safer for the people around you as long as they are used and discarded properly and the hands are washed and dried immediately. When it comes to workplace hygiene, Fresh and Clean is a name that has been trusted by businesses for many years. Alsco offers solutions that help businesses keep the workplace clean and hygienic and most of all, safe for everyone – workers, visitors, and business partners alike. Call us today and we’ll help you find clean and green solutions for your workplace!